Synopsis: Audrey and her two best friends have just transferred to Jemison High from their tiny private school. They’re a nerdy little trio, so everyone is shocked when the handsome new guy, Wickham Hill, asks Audrey out. Audrey is so smitten that she doesn’t pay much attention to The Yellow Paper, a vicious underground school newspaper…until it threatens to tell a tale that could change everything. 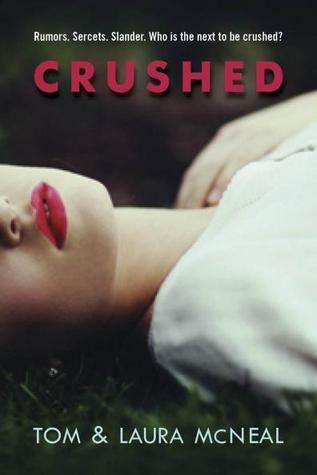 Crushed was a very fast, easy read, but ultimately it fell flat and it didn’t leave me feeling much of anything at all. I felt the characters were one-dimensional and uninteresting, which is automatically a negative in a contemporary where the main requisite is that I need to care about these characters. The main character, Audrey, was very unlikeable and I couldn’t quite feel any sympathy for her regarding the situation with her father or the woes in her relationship with Wickham. And Wickham? He is clearly supposed to be one of those “swoony” characters, but he screamed “slimmy” from his first introduction. Like Audrey, I felt no sympathy for him or his mother. (Speaking of his mother, what’s with all the women in this book being defined by and/or obsessed with the men in their lives?) I’m completely at a loss for Theo’s purpose except to present a very clear and present antagonist. The only reason I could connect on a tiny level emotionally with Clyde is because I recently experienced losing a parent slowly, but without that first-hand experience, it probably wouldn’t have resonated either. The fact that is most disheartening is that I felt this book had a lot of potential, but somehow, it glosses over all the issues and rushes itself.